Wild Hare Brand of beef jerky is another newcomer to the world of meat snacks, having launched just a couple of years ago. It's owned by Wild Hare Foods, LLC, based out of Belleville, WI. When I first saw Wild Hare jerky, my first impression was that it's rabbit jerky, especially since it's logo features a rabbit riding a motorcycle. But it's not. It's beef jerky. It was named after the company's founder, Scott Hare. Hare tells me that because other people have made the same confusion, he's coming out with a new logo featuring a cow and pig riding a motorcycle. The jerky earned entry into the "Something Special from Wisconsin" program which requires food products to be at least 50% made from Wisconsin grown ingredients, or made in Wisconsin. And earlier this Spring, Wild Hare jerky won "Grand Champion" in the whole-muscle jerky category at the Wisconsin Meat Product Show, which apparently is the largest show of its kind in the USA. 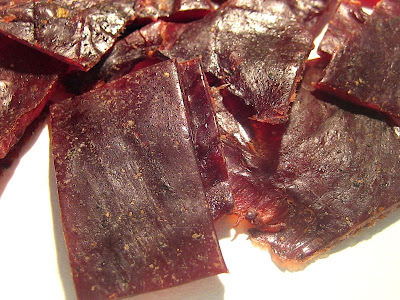 Some 40 "food scientists" claimed that Wild Hare's jerky was the best jerky in the State of Wisconsin, based on its appearance, taste, and aroma. Considering I'm just one jerky reviewer against 40 "food scientists" I really have my credibility on the line here. Beef, soy sauce, salt, sugar, maple sugar, spice, flavoring, dextrose, garlic, onion, sodium phosphate, sodium nitrite, potassium sorbate. The tastes I pick up from the surface of these pieces is a salty, smoky flavor, with a faint bit of sweet. There's also a bit of meat aroma similar to that of a summer sausage. Moving into the chewing, the first taste that comes out is a stronger salty flavor and the natural meat flavors. I can taste the garlic back there, and I can feel a faint spicy tingle in the back of my mouth. Right off the bat, this is jerky has a strong flavor to it. The sensory receptors in my tongue are inundated with stimuli. The taste that dominates this jerky seems to be a tie between the saltiness and the meat flavors. On a piece-by-piece basis, I don't find it too salty to handle, but over the course of several pieces, the saltiness leaves my mouth yearning for a drink. The meat flavors have a taste very similar to that of summer sausage, though perhaps with more of the meaty taste than straight summer sausage. The meat flavors are indeed strong enough to give you a good sense that you're eating meat. The next strongest flavor in this jerky is hard for me pin point. But I'd throw it to the garlic. But it's not a strong flavor. The salty and meat flavors are so dominant, that it's not even correct to name the garlic as strong flavor. I also mentioned above that I was getting a spicy tingle brewing in the back of my mouth. Scott Hare mentioned to me that this recipe is actually based on a cajun style of seasoning, but for marketing purposes I wouldn't label this as a cajun variety. But it does indeed have a spiciness reminiscent of chili pepper seasoning. I'd rate the spiciness as mild-medium. There's also a black pepper aftertaste that I'm getting after several pieces. Here and there, I also picked up some other spice, which I'm not sure was, but I'm thinking maybe oregano? Considering soy sauce has the second highest weight in the ingredients list, I really don't taste much of it. 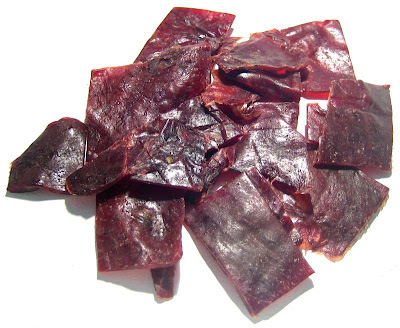 Overall, this original variety of jerky from Wild Hare has a strong flavor, mostly as a salty meat taste, similar to that of summer sausage, and will throw in a small dose of garlic and pepper flavors. These appear to be slices of whole meat, sliced thin, and in small bite sized pieces. This is a soft and tender jerky, being very flexible. The pieces have a rubber-like quality to it, but yet they still chew with some ease. The chewing experience retains some of the steak-like quality, but also has that rubbery nature. In the first few chews, a piece tends to resist breakdown by flexing and bouncing back to its original form. But with enough chewing, it eventually gives way, and takes on more of the steak-like quality. These pieces also have some moisture to the touch, some more than others. Maybe that's the potassium sorbate they spray on there. My fingers often require some licking to get all the residue off. Wild Hare Foods sells this jerky from their website at a price of $23.75 for a case of 16 ounces. That works out to a price of $1.48 per ounce, making this an average priced buy. I think it has a pretty good snack value at that price, with is strong flavor, a good amount of meat flavors, and an easy to eat consistency. Though, you might find that snackability wearing out fast if you don't like jerky as salty as this. While I'm not a big fan of salty jerky, I can overlook that if a jerky can offer exceptional taste. I think its strongest asset is the meat flavors, which is well presented. A strong meat flavor will always score points with me. It's unique sausage-like flavor, with notes of garlic and peppery spiciness creates a delicious jerky. But I'm just one of those snackers who prefer lightly salted jerky, and this one is just too salty for me. Also the rubber-like texture in the first few chews will detract from the overall chewing enjoyment. But taste and texture are both subjective, and I'm sure there's no shortage of snackers who like their jerky this way. I'm not sure if those 40 food scientists would agree with my assessment, although I don't know how many other whole-muscle jerkies they compared this to, and I don't know what degree of detail they used in their analysis. Considering the Wild Hare brand seems to focus on strong flavor, I'd love to see them come out with a hot sauce variety, that packs in tons of tomato/vinegar/chile taste, and tones down the salt. That would be yummy. For my beer recommendation, I'd go with honey blonde ale, to help quench that saltiness. I haven't tried this jerky, but I love the beef sticks! They are delicious and offer very little fillers, which makes for a great beef snack versus a beef fat snack. I order them online from the web site and plan on ordering some for the athletes in my family.